Britain's biggest electrical retailer, DSG International, is selling The Link - its chain of mobile phone stores. Spanish-owned operator O2 will pay about £30m for DSG's 60% stake in the firm, which has struggled against online and High Street competition. 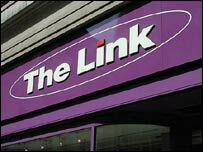 The Link employs 2,300 staff in 300 stores across the UK. DSG, which owns the Dixons, PC World and Currys.digital chains, also reported a 4% fall in underlying annual pre-tax profits to £318.2m ($589m). DSG chief executive John Clare said that the retail market for mobile phones had "changed significantly" and was now best suited to networks and telecom services providers. "The sale of The Link will enable us to focus on our core multi-channel electrical and computing formats as we pursue our leadership ambitions across Europe," Mr Clare said. Greg Hodge, an analyst at Planet Retail, told the BBC that The Link had struggled to win over customers in recent years. "It has been the thorn in DSG's side for some time now," Mr Hodge said. "It has been pigeon-holed as a pre-paid mobile phone shop whereas rivals like Carphone Warehouse and Virgin Mobile have built up a reputation for customer service. "They are getting their phones from there, or from places like Tesco or telecoms firms such as O2." It is the second deal in two days for O2. On Tuesday, O2 bought broadband network Be for £50m. DSG is trying to make Dixons, trading as dixons.co.uk, a strong online brand and is rebranding its Dixons' High Street stores as Currys.digital. It plans to employ 3,000 people in the next year, including 1,000 in the UK. Sources close to the company said this was to allow more face-to-face contact with customers as well as to staff new stores. But DSG faces pressure from online retailers and supermarkets. It said that for the year to 29 April sales across the group rose 6% to £7.4bn. Mr Clare said the overall results were "satisfactory" and had picked up in the second half of the year. The group said it was "cautious" over consumer confidence in the next 12 months, but was confident of increasing market share in its core markets including computing, televisions and DVD players.